Serve with a few avocado slices on the side. This was delicious! I used canned enchilada sauce because I didn’t have all the ingredients to make homemade but wow – amazing! I cut the recipe in half and still got 3 servings out of it. Will definitely make this again. I am planning on making this tonight and trying to think of a way to sub out the sour cream (can’t do cream cheese or Greek yogurt.). Any suggestions? Question… I don’t have a skillet. Can I bake it in a casserole dish? Do I still set the temp for 500? My family loved this! So good and so filling! So amazing! It was really tasty and had good sized portions. It was pretty quick to throw together. I will run this through the recipe builder later. Super easy to make and really good! My husband is the type that eats and then is hungry 20 minutes later-not with this recipe! Leftovers were great the next day too…. Easy Peezy and delicious. Not a fan of corn tortillas so I used flour and didn’t find them chewy at all. Hubs and I already looking forward to leftovers for lunch tomorrow. This was fantastic and so easy to bring together. For those of you who never eat 9-point meals (way too rich for me), I managed to bring it down to 3 points by doing the following: used only chicken breast (btw, 4.4 oz cooked = one cup, so 17.6 oz used for this recipe), used light cheese and fat free sour cream. We also divided it into 6 servings (instead of 4), and it was more than enough. If you want to keep the servings to 4, then it’s 4 points per serving. I loooove the taste of the corn tortilla. Next time I will cut them into strips so that I can be sure to get some in every bite. Thanks Gina for another winner (although truthfully at this point they are all winners!). 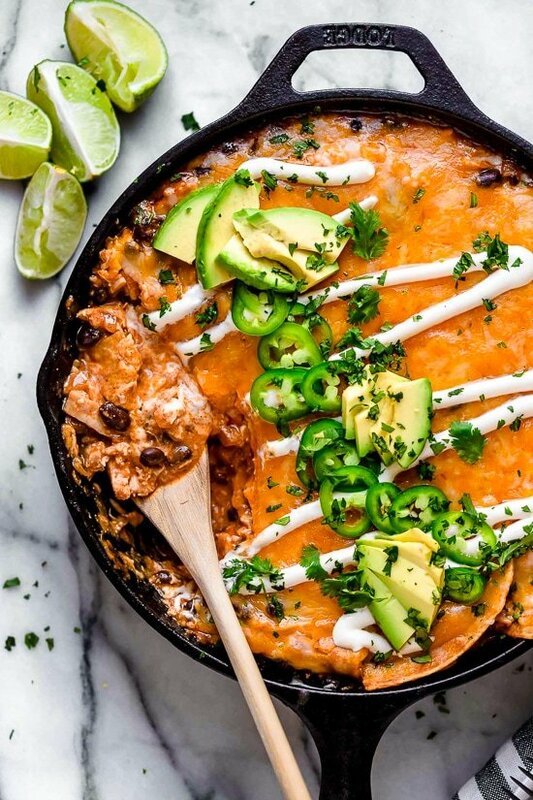 This recipe states that it is 9 freestyle points, but when I put it in the Weight Watchers calculator, it says 13 smart points. Why is this off? A new family favorite. I serve it on lettuce with fresh baby heirloom tomatoes. Yum! My husband has me add corn to his serving. This is delicious! I hate beans so I skipped those but this is amazing. Super easy to make, too! Definitely recommend! I made this tonight and it was awesome! I also used Trader Joe’s bottled enchilada sauce (12 oz). I was wondering how you would freeze this since it is labeled as freezer-friendly? Thanks! Curious about this too! Thanks! Curious about this too. Thanks! I always struggle with lunch ideas and when I saw this one I was excited to try it. It was absolutely delicious! I made it exactly as written, but I doubled up on the jalapenos. Reheated well, tasted excellent and was a really satisfying meal. Bonus points for being very easy to put together. I assembled and baked it after dinner one night, as I was planning on using this exclusively for lunches.Will definitely make again! Might add some corn next time! Awesome! I loved having enchiladas without the assembly. I think I used too much liquid in one of the steps. I had a little enchilada sauce left (and I could see the oil in it, making me think I had used too much oil, oops!) Anyway, I just added another tbsp of flour to make it a paste then stirred it in to the whole dish. I cooked it on the stove top a little longer to let it reduce and then all was well. My family and I really liked this meal. I used boiled chicken breasts that i shredded and canned enchilada sauce but followed the rest of the recipe. I did use 6 corn tortillas, but I think I’d like it even without any corn tortillas in it and just use as a dip for chips. I’ll make this again, especially since I didn’t get any leftovers. Delicious and so easy to make. Swapped the sour cream for nonfat greek yogurt and it was great! Delicious!! I’ve loved all your recipes that you posted in the past year. You helped me lose 30 pounds on WW freestyle program. Thanks for all you do, Gina! I made this for my husband and I this weekend and it was a hit with him! Full of flavor, easy to make, and very filling. I will definitely make this again. This was so good!!! Lots of flavor without breaking my dinner calorie goal and so easy to make. We added a little more of the adobo sauce in the enchilada mix to add some more spice, it turned out great! I used green chile enchilada sauce and LOVED this recipe!!! I have been eating it breakfast, lunch and dinner! This morning I topped with a fried egg, avocado, tomatoes and fresh jalapeno. I can’t get enough of this yummy, easy dish! Is there somewhere I can find the WW ponints for the cookbook recipes? Thanks! Yes! Under my Cookbook Index tab. Really excellent combination of flavors. Quick and easy! 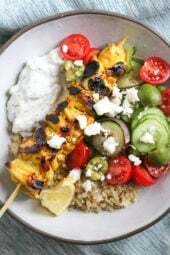 Loved this recipe and love the meal plans, I recently started following them. Thank you! My family – my college age son in particular – loved this meal. He’s a casserole-doubter but this recipe made him a believer. He said it was delicious and thanked me for making it. Easy list of ingredients. Easy to assemble. And seconds for every one. Made this last night. I sprinkled a little tex mex seasoning on top of the cheese before putting in the oven to bake. This dish was delicious and a new family favorite. My husband and I loved this. I don’t have a cast iron skillet (need to get on that) so I just used a large sauté pan and covered it with the lid at the end instead of using the oven. It still came out fantastic. I guess you could also bake it all in a baking dish instead if you feel strongly about having it baked. I made shredded chicken in the crockpot and used that instead of buying a rotisserie chicken. I’ll be honest, I’m not sure I can bring myself to assemble enchiladas again after how easy and delicious this was. Absolutely amazing. I highly recommend making the homemade enchilada sauce as well! Definitely takes the dish to another level! 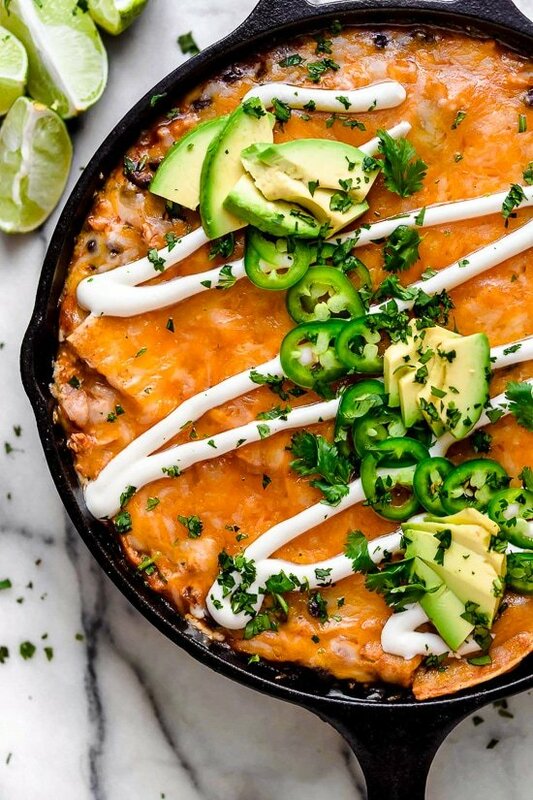 Just made your Cheesy Rotisserie Chicken Enchilada Skillet with ground beef instead of chicken. It works out great without modifying your ingredient amounts. I also, for the first time ever, made your homemade enchilada sauce and it is absolutely delicious! Thanks for providing a great recipe to make on a snowy day. This was fantastic!!! Made it tonight and the little asked for more. I made mine with Trader Joe’s enchilada sauce (12 oz) and their hatched chile salsa. I added a can of fire roasted corn to the mix because of corn, duh! I added 1 potato to the bottom of the skillet and topped it with the mixture. Served with avocado and a little more sour cream to diminish the heat for her. This is a definite keeper!!! Thank you for sharing. I did not adjust a single thing…it was SO easy that I felt like there was no way it could filled with flavor but it was! Definitely going into my rotation. One of my favorite meals so far!! I made “enchilada” salad with the leftovers, YUM! This recipe is AMAZING! I tweaked some of the ingredients and got the WW points down to 5! As a side, I made the weight watchers refried beans for 0 points. They went perfectly together! I am adding this recipe to my regular weeknight dinners!! Thank you Gina! 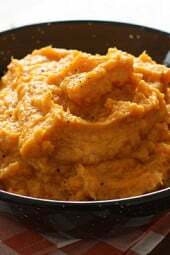 I absolutely love this recipe and it is super easy! Hi Gina, did . you calculate the points using your own sauce (which has zero), or canned sauce (which is usually much more)? This was SOO good, and so easy. I used lite sour cream, canned enchilada sauce, and added some frozen fire roasted corn to the mix and it turned out delicious. Does not taste ‘diet’ at all. Since I don’t have an oven proof pan, after cooking the onion mixture I just mixed it all up in a casserole dish and baked at 350 for 25-30 minutes. Absolutely perfect! Delicious, but very rich! Came together quickly and the rotisserie chicken was a great shortcut. SO SO good! Definitely make it with homemade enchilada sauce- you won’t regret the extra work. However I tweaked mine just a little bit, as we don’t own a cast iron pan. I used an 8 x 11 glass dish, baked at 425 F for 25 minutes with the cheese on top the whole time. Turned out perfect!! I’m not a bean lover. What can I substitute? Made this last night for my boyfriend. Made it with green sauce. It was delicious! He loved it! Beans are a no-go for me. Do you have any other substitution suggestion for them in this recipe? I know I can just leave them out, but figured I’d get your opinion first. Thanks! Made this tonight with the homemade enchilada sauce. The dish was great! Thanks! This was delicious! I made this along with the homemade enchilada sauce and it was so good. Portions were huge so I ended up doing 6 servings and still had a very filling meal. I served with corn on the side and topped with avocado. This was absolutely delicious! I made this for dinner tonight and everyone loved it – my husband, and both my kids (14 & 19). I’ll definitely put this in my regular meal rotation! So if I’m using your homemade enchilada sauce recipe, how many cups is 16 oz of enchilada sauce for this recipe? I made this tonight. My family had seconds! Made this tonight for dinner, family loved it. Served it with an iceberg salad. 2 things I did differently,,,I didn’t use a rotisserie chicken because I don’t like dark meat, and I didn’t make the enchilada sauce. I cooked chicken breast in my instant pot and shredded it. Used about 3 1/2 breasts to make 4 cups of chicken. I used 2 8 oz packages of Frontera Red Enchilada packages from Harris Teeter. Felt like the recipe was a bit salty, but it was delicious. Also, the tortillas fell apart when mixing together, which didn’t really matter. Dish doesn’t have a layered effect, its all kind of mixed up together. We made this tonight for dinner using your homemade enchilada sauce. That sauce MAKES this recipe! We made the sauce this weekend so we were ready to go tonight. The portion size was large and if folks are concerned about the points, change the servings to 6! It was delicious Gina! Thank you for another winner! Super easy recipe and the whole family enjoyed it! Will make it again! Approximately how many cups is 16 oz of enchilada sauce? I’m trying to figure out how much of your homemade enchilada sauce I need to make for this recipe. Your enchilada sauce recipe makes 4 cups. This is a keeper, however, for my taste, I think it could use more seasoning; (I used canned enchilada sauce). I will add more cumin next time and maybe something spicy (hot enchilada sauce?) I will add the chopped jalapeño to the mix too. I chose to mix it all up and put in a casserole dish and bake it @ 400. Came out great. Definitely needs the chopped jalapeño for a little heat and cilantro. A little extra sour cream and avocado too! Delicious! So easy and delicious! I made the enchilada sauce to and it was easy and excellent-thanks!!! Hi Gina! This looks so good, and I’m pumped to make it. Do you think that the leftovers would keep? It’s just me and my husband at home, so thinking there will be a good bit leftover! If not, we might have to invite some friends over the night we make it lol. 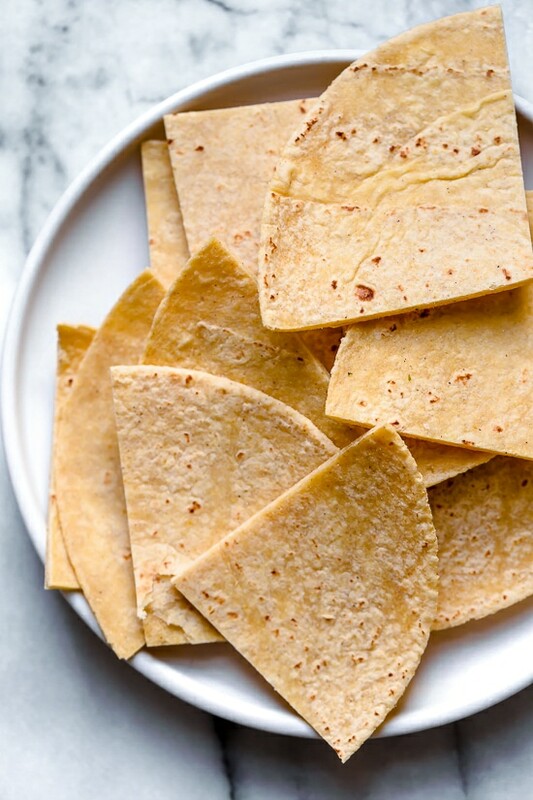 What do you think about using corn tortilla chips in place of tortillas. I realize they wont fold in as nicely as the tortillas will but perhaps they could be crushed or “soaked” in the mixture? You may have issues with the salt content using chips. But if you use a low or no-sodium enchilada sauce (or unsalted chips I guess) it would probably work out. 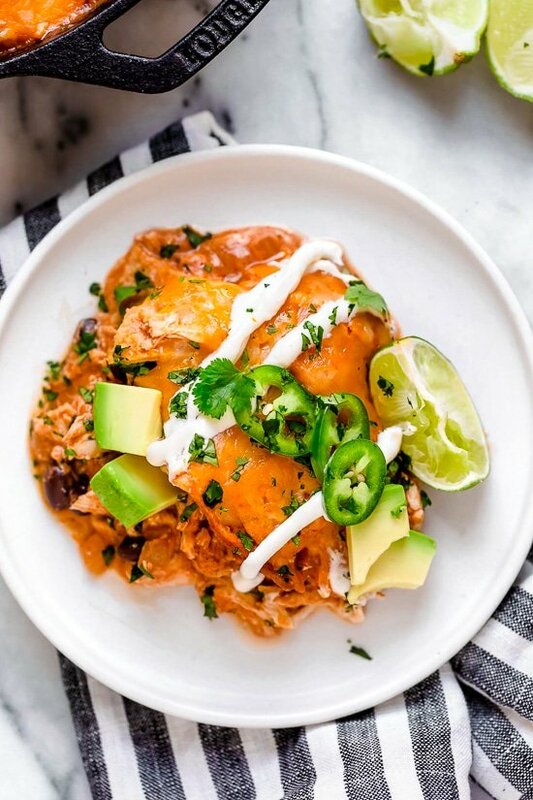 You will probably end up with a texture more similar to chilaquiles than enchiladas, but chilaquiles are super yummy too so hooray either way! Did you know that you shouldn’t use any tomato products in a cast iron skillet? It will leach iron that your body can’t handle. There is very short cooking time in the recipe. I’m sure it’s fine. If using boneless, skinless thighs, would it have to be cooked longer? This uses cooked chicken, cooked thighs would be the same time. What size corn tortillas did you use? Thank you for asking this. I was wondering the same. I’m unsure, since it’s not ‘layerd’ with the tortillas on the bottom, why is it necessary to dirty a bowl? The recipe reads as if it can be a one-pan meal. I did this in one pan, and it turned out great! I also set the oven at 350 and baked for about 20 min instead of broiling. I just made it all in the skillet! Turned out fine! 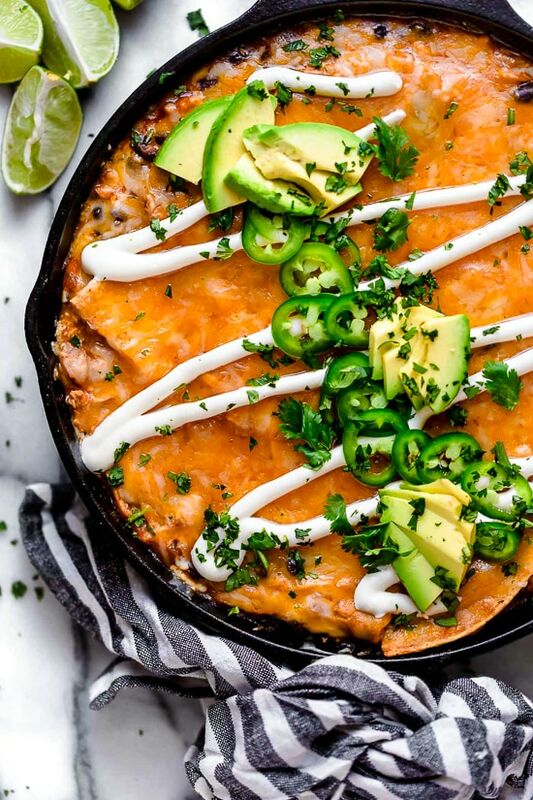 My guess is that it starts to warm up when combined in the skillet and if you don’t want the sour cream to start cooking, do it in a not hot dish. I think next time I do it, I’ll just have all the things ready to go so I can dump, stir, dump, stir quickly and not worry about if the pan is hot or not. After all, I used my daughter’s plate since I ate after the kids last night so that I’d have one less plate to wash! LOL. 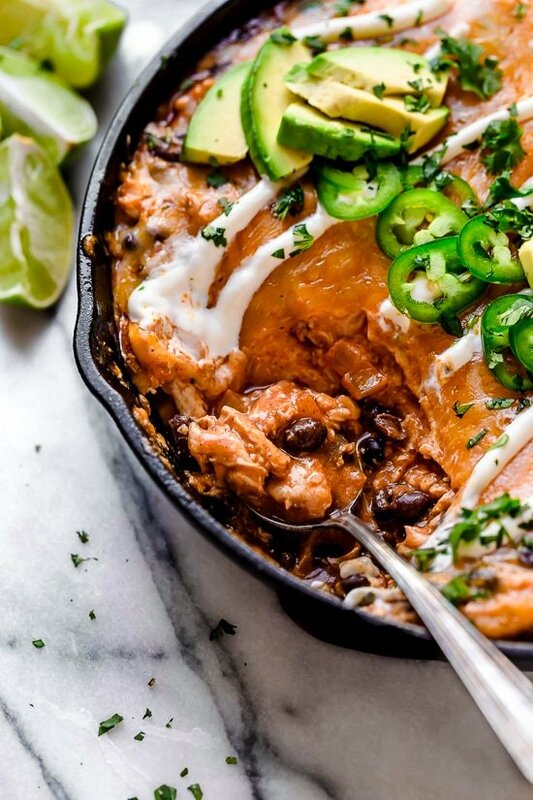 If you used boneless skinless chicken breast and substituted nonfat plain greek yogurt for the sour cream how many points would you save? 9 may be a bit much for me in an entree so I am going to play around with it. Hello! 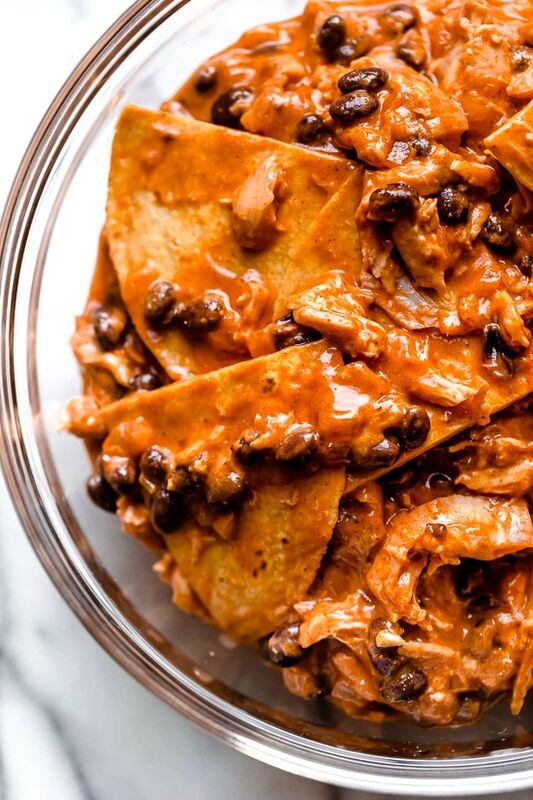 Could this be tried with flour tortillas or would it be too chewy? Not sure, if you try let us know! I just made this tonight with flour tortillas because I don’t love corn tortillas either. I really liked the entire meal and will definitely make it again, but the flour tortillas are a little chewy. I ended up baking at 350 while putting the kids to bed instead of broiling so I’m wondering if next time I broil will the tortillas on top get crunchy instead of chewy. Either way, I’m excited for leftovers tomorrow and am making it again with the flour tortillas. Great recipe! Is the sour cream included in the points? Hi Gina, I’d like to make this for a group of 8-9 ladies in my book club and baking it would be much easier in a 9×13” pan. If I just double it and bake it instead, for how long do you recommend and at what temp? Also just received one of your cookbooks as a Christmas gift and am eager to try more recipes! Thanks in advance. Sure, 350 until it’s hot, maybe 30 min? I am guessing. Wondering what I could replace the tortillas with…..maybe sliced or riced cauliflower? 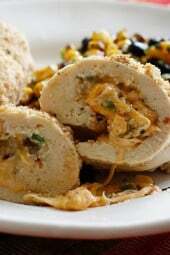 You could use Ole’ Extreme Wellness tortillas at 1 pt each and buy reduced fat shredded cheese and refigure the points. It should come in at less. Did you use full fat sour cream and cheese when you calculated the ww points? Thanks! I’m thinking that she didn’t factor in the sour cream when calculating points since it is listed as optional and she didn’t say how much sour cream to use in the recipe or how much a serving of sour cream was with the points calculation. I think the points are just for the dish itself. It doesn’t look like the avocado is calculated either. It will depend on if a person decides to use it and how much they use. I hope this helps. ???? It says to put 1/4 a cup of sour cream in the mixture. She also says it’s always full fat unless she says otherwise. You can always use plain non-fat yogurt as a sour cream replacement. It’s zero points. Just make sure you temper it first if your liquid is hot so it doesnt curdle/separate. I can’t wait to make this next week!!! How long will your enchilada sauce keep in the refrigerator for? The instructions seem off. Why heat oven — and so high — and not use it later? #7 says to put back in oven for 5 minutes to melt the cheese. The oven is used in step 7. This looks like a camping possibility. Could you just cook it with the lid on the pan to melt the cheese? This is exactly what I did. Didn’t want to put my skillet in the oven. Worked well! Just put it on low for 5 minutes with the lid on.